Conservatives Start Air Assault Against Donald Trump : It's All Politics A deep-pocketed conservative group is going on the attack against Donald Trump, spending $1 million on TV ads in Iowa to weaken the GOP presidential front-runner. 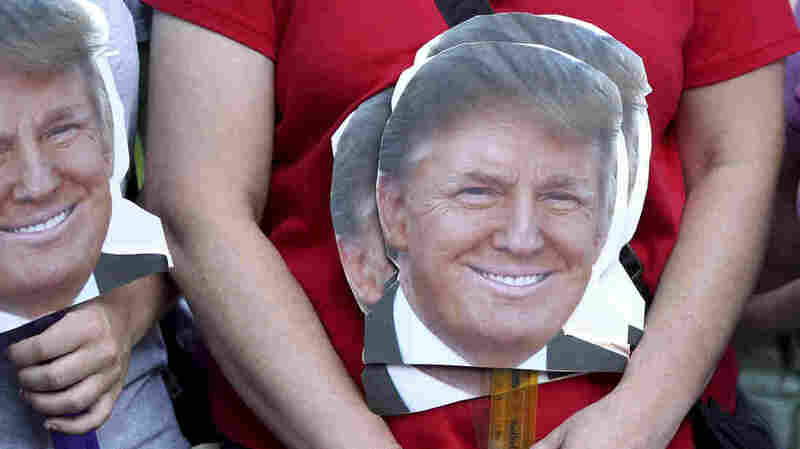 A woman holds signs depicting the head of Republican presidential candidate businessman Donald Trump as she waits to enter the auditorium to hear him speak in New Hampshire. A deep-pocketed conservative group is going on the attack against Donald Trump, spending $1 million on TV ads in Iowa in an effort to weaken the GOP presidential front-runner. The anti-tax group Club for Growth — ironically, known for taking down establishment insiders in favor of more conservative outsiders in Senate and House races — is now turning on Trump, who it sees as a closet Democrat. Club for Growth Action, the group's political arm, will launch two 30-minute TV spots on broadcast, cable and digital platforms to hammer home to Hawkeye State voters — where Trump's lead has slipped thanks to an insurgent Ben Carson — that the reality TV star is simply an entertainer who will say anything to get elected. "Trump wants us to think he's mister tell-it-like-it-is," the first ad says. "But he has a record. And it's very liberal. He's really just playing us for chumps." A second ad points out that while many conservatives panned the 2005 Kelo v. City of New London decision that established eminent domain for private use, Trump, the developer, has used it to his advantage. "Trump supports eminent-domain abuse, because he can make millions while we lose our property rights," the ad says. "Trump: the worst kind of politician." The Club for Growth's attack makes it the first major conservative group to step out forcefully against Trump. His rivals have tried to attack him with similar missives, but they've been ineffective, as Trump has surged and they have faded. But these ads have big money behind them, with more hits backed by big bucks likely to come. If Trump is going to fade, it will take attacks like these that more and more people see — coming to know Trump for something more than just his own talk and TV appearances. "His angry style may reflect the deep frustration Americans have with Washington leaders who have failed to keep their promises," Club for Growth president David McIntosh said. "But the policies he'd implement would benefit himself and his own interests, not the American people. That makes him the worst kind of politician." Still, the Club for Growth has also seen limitations. In 2008, it went up in Iowa against another candidate whose record on taxes it didn't agree with — Mike Huckabee. Huckabee went on to win the Iowa caucuses that year. The group previously announced it would bundle donations for five other GOP candidates — Texas Sen. Ted Cruz, former Florida Gov. Jeb Bush, Kentucky Sen. Rand Paul, Florida Sen. Marco Rubio and Wisconsin Gov. Scott Walker. Trump has fired back at the group, saying its move only comes after he rebuffed requests for donations. But so far, while others in the party have bemoaned the dangerous rise of Trump, it's only the Club for Growth that is putting money behind their objections in a serious way.